Set in a quiet corner of Southwest Montana, the Philipsburg Valley Scenic Loop is a forty-mile loop drive that passes in the shadow of the Sapphire, Anaconda and Flint Creek Mountain Ranges. The drive essentially makes a loop around the southern portion of the John Long Mountains that lie to the west of Philipsburg. 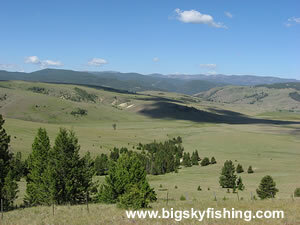 Unlike the northern portion of the John Long Mountains that are tall and forested, the southern portion consists of smaller, rolling hills that are a mix of forest and open grasslands. Highlights of the drive include the historic town of Philipsburg, the Philipsburg Valley, the John Long Mountains, excellent views of towering mountain peaks and Rock Creek. Beginning in the town of Philipsburg, the scenic byway heads south on Montana Highway 1, which is also part of the Pintler Scenic Route. This part of the drive passes through the Philipsburg Valley. The snow-covered peaks of the Anaconda Range rise abruptly to the south, while the Flint Range dominates the skyline to the east. Six miles south of Philipsburg, the byway turns west on Montana Highway 38, which is also part of the Skalkaho Highway Scenic Byway. During this stretch, the drive continues to wind through the Philipsburg Valley. Vast stretches of grasslands extend in all directions, with the snowy peaks of the Anaconda Range providing a scenic backdrop. For those seeking camping and hiking opportunities, several side roads cut to the south and head toward the Anaconda Range and East Fork Reservoir. After twelve miles, Highway 38 reaches the junction with Rock Creek Road. The Skalkaho Highway Scenic Byway continues to the west, following Highway 38. The Phillipsburg Valley Scenic Loop turns north and follows Rock Creek Road (also known as County Highway 102), a gravel road that roughly follows the famous Rock Creek. Although this portion of the drive is gravel, the road is flat and generally in good condition. For the next eight miles, the scenic drive passes through a narrow valley as the route follows the river. Small, forested mountains rise off the valley floor to the west and the open, rounded mountains of the John Long Mountains rise to the east. After eight miles, the drive reaches the junction with Montana 348, a paved highway, and heads east toward Montana Highway 1 and the town of Philipsburg. In my opinion, this is the most scenic part of the drive. The route begins climbing toward a low pass that cuts through the John Long Mountains. 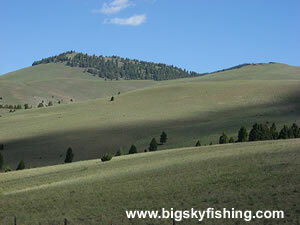 From this pass, the views of the John Long Mountains and the distant peaks of the Sapphire Mountains are excellent. Overall, the Philipsburg Valley Scenic Loop is an enjoyable drive that provides excellent views of the scenic Philipsburg Valley and the snow-covered peaks that surround the valley. Anyone who is visiting the historic town of Philipsburg, or is taking the Pintler Scenic Route, should definitely make the time to take this scenic journey through this quiet area of Montana. The map below shows the route and location of the Philipsburg Valley Scenic Loop in Montana, along with several other nearby scenic drives. The only services located along the byway are in Philipsburg. In Philipsburg, there are plenty of restaurants, small shops, as well as places to pick up camping supplies and gas. Two small hotels and a RV park are located in town, too. See the Philipsburg Information Page for more details regarding lodging options.